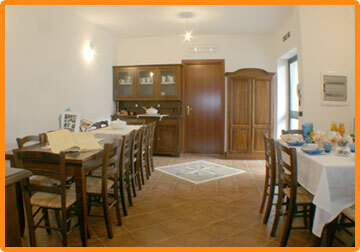 Rita and Renzo’s B&B is a recently built home in the quite village of Riola Sardo, in the Province of Oristano. It has 3 en-suite bedrooms and it is totally separated by the owner’s house. 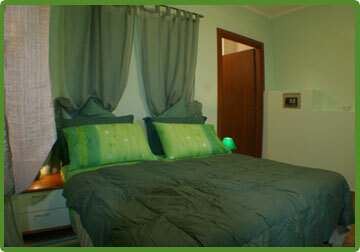 This B&B is an enjoyable accomodation for a nice holiday. 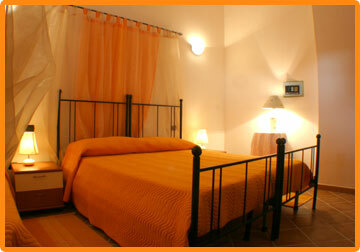 Each bedroom is furnished to a high standard in warm colours. On the ground floor there is a large sitting room where the hostess Rita serves the rich breakfast, you can taste the good sardinian food, in the patio you can relax, read or chat after a day spent visiting the nice places around. On the ground floor there is a twin en-suite bedroom with disabled access. On the first floor there are 2 double en-suite bedrooms, it is possible to add a bed in one of this. All the bedrooms are en-suite with shower, own entrance, tv, fridge, safe, air –conditioning. In the sitting room tv, dvd and mp3 player, pc, small library and many information about the sourrondings, restaurants, museums and places, besides a common laundry and washing machine. Rita and Renzo B&B is ideally situated for easy access to beaches, Riola Sardo is just 10 km from the Peninsula of Sinis with its well known beaches, Is Aruttus the quartz beach, San Giovanni with the ancient town of Tharros, Putzu Idu, S’archittu and so on. Local golf , riding-scholl and fishing facilities just at few km. Deposit back within 30 days before arrive, 50% deposit back 15 days before arrive, after no deposit back.